This picture is from back in September! 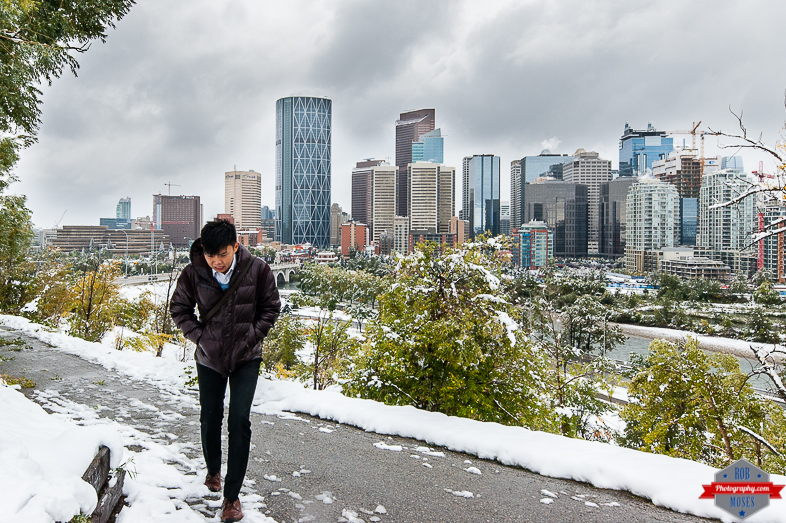 We had a freak snow storm here in Calgary this year and this guy did not seem to stoked to be walking around in it haha. I could tell he was a nice relaxed kind of guy though, because I had to get extremely close to him to get this shot and he didn’t mind. I was shooting an ultra wide angle lens at 16mm (actually 24mm on the crop sensor camera), which isn’t exactly your ideal street photography focal length. I was actually just there to get a skyline shot, then I saw him walking along and decided to snap a photo. This entry was posted in Street Photography and tagged 10-20mm, 16mm, 24mm, Alberta, beautiful, bow, bridge, building, buildings, Calgary, Canada, Canon, city, City Life, clouds, condos, crop sensor, D70, freak, guy, man, metro, nice, Nikon, Park, photo, Photographer, Photography, pretty, River, Sigma, sky, Skyline, skyscrapers, Snow, storm, street, street photography, ultra wide, Urban, walking, yyc, zoom. Bookmark the permalink. Rob, you take some interesting shots, but this one is beyond superb. It is surrealistic. You are so very talented!